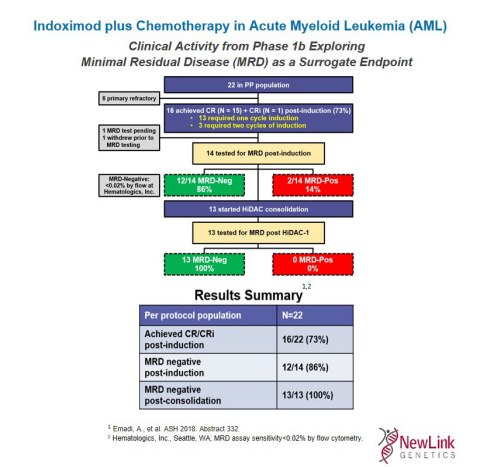 AMES, Iowa & SAN DIEGO--(BUSINESS WIRE)--Dec. 2, 2018-- NewLink Genetics Corporation (NASDAQ:NLNK) announced that updated Phase 1 data evaluating indoximod plus standard-of-care chemotherapy for the treatment of adult patients with newly diagnosed acute myeloid leukemia (AML) were presented today by Ashkan Emadi, MD, PhD, Professor of Medicine and Associate Director for Clinical Research, University of Maryland Greenebaum Comprehensive Cancer Center, in an oral session today at the 60thAmerican Society of Hematology (ASH) Annual Meeting in San Diego, CA, from 9:30AM – 11:00AM PT, in Grand Hall B, Manchester Grand Hyatt. This Phase 1 trial evaluated the initial safety and preliminary evidence of clinical activity of adding indoximod to standard 7+3 induction and high-dose cytarabine (HiDAC) consolidation chemotherapy for adult patients with newly diagnosed AML. The presentation highlighted an initial safety profile indicating that the treatment regimen was well tolerated with adverse events commensurate with chemotherapy alone. Evidence of clinical activity was observed for indoximod plus chemotherapy in newly diagnosed AML as supported by these Phase 1 data showing post-induction minimal residual disease (MRD) negativity rate of 86% and post-HiDAC1 MRD negativity of 100%. Fifty-seven patients were screened, and 38 patients initiated induction therapy on protocol. Five patients never received indoximod resulting in an intent-to-treat (ITT) population of 33 patients. Twenty-two patients received the pre-specified 80% of indoximod dosing required to be included in the per protocol (PP) analysis, 8 received less than 80% of the scheduled indoximod dosage, and 3 patients remained on induction treatment as of the date of data cut off. Of these 22 PP patients, 16/22 (73%) achieved complete morphological response (CR) and 6 were primary refractory. Of the patients who achieved CR, 14 had results available from MRD testing post-induction. MRD negativity was defined by a flow cytometry assay at a level of < 0.02% (Hematologics, Inc., Seattle, WA). Of those tested, 12/14 (86%) were MRD-negative. Of the 14 patients, 1 patient proceeded to transplant, and 13 began HiDAC consolidation therapy. Post-HiDAC consolidation, all 13 patients were tested for MRD status with all 13/13 (100%) reported to be MRD-negative. When benchmarked against available published studies, these initial data appear encouraging. For a more precise comparison, a contemporaneous multi-institutional dataset is being aggregated to benchmark these data against data generated from patients undergoing the same chemotherapy regimen without the addition of indoximod using the same MRD assay assessed at the same reference laboratory. Safety data from this Phase 1 trial indicate that the combination therapy regimen was well tolerated. No RLTs were observed when combining indoximod with standard-of-care chemotherapy. Grade 3 or greater adverse hematologic events included febrile neutropenia, anemia, and thrombocytopenia while non-hematologic events included hypoxia, anemia, and pneumonia. The overall adverse event profile observed in this small sample size is consistent with that of 7+3 induction chemotherapy plus HiDAC consolidation alone. Adult acute myeloid leukemia (AML) is a cancer of the blood and bone marrow in which the bone marrow makes abnormal types of white blood cells, red blood cells, or platelets. AML is the most common type of acute leukemia in adults and tends to progress rapidly without treatment. In the US, approximately 19,000 patients per year are diagnosed with AML with only around 25% expected to survive longer than three years. Of those newly diagnosed patients, approximately half are categorized as young and fit for an aggressive chemotherapy treatment regimen.